2012 marks a big year for the Arturo Fuente cigar making family. They have been in business for 100 years now, and certainly few can make that claim, even fewer are more worthy of 100 years of success than the Fuentes. In their hundred years they have suffered as much great tragedy as they have enjoyed great success, from hurricanes to large scale fires, and humble beginnings to top rated blends. In addition to their success as a business, and a cigar maker, the Fuentes play a key role (ie. half partners) in the Cigar Family Charitable Foundation, a joint effort with the J.C. Newman family brand, that has done wonders in Fuente's base country of the Dominican Republic to help children in need, from schooling, to clothing and feeding them. 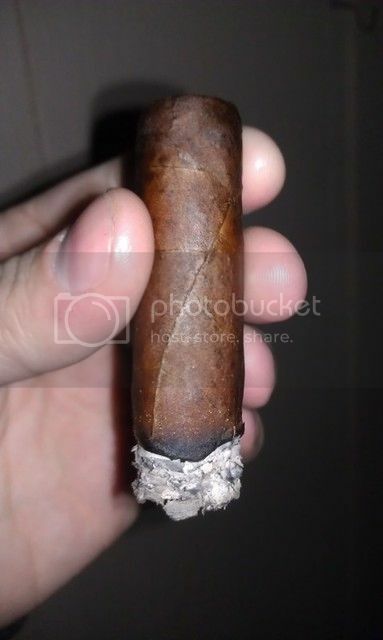 A few weeks ago, word starting appearing around the web of 13 count boxes of Forbidden X cigars in new sizes, with names worthy of chapters from the Egyptian Book of the Dead (ie. LONG) showing up at some of the top Fuente accounts. 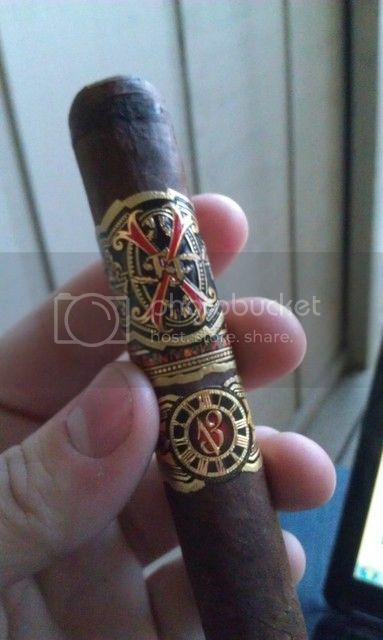 The cigars are packed in large, varnished boxes, and in addition to the standard Forbidden X band, they have a second, smaller band depicting the same clock shown on the Don Arturo bands (Roman numerals around the edges, arabic numeral 1 and 3 as the "hands" of the clock). The Heart of the Bull 1957 is a roughly Robusto sized cigar, with a slight box press to it, and a dark, chocolate brown wrapper (not a maduro presumably, but easily categorized as Colorado Maduro or darker). The construction is flawless, showing tight seams, and a clean looking triple cap. The foot bares a couple of fat looking veins, but none that look as though they may be problems. The cold aroma is very pungent, offering a well defined raisin and cinnamon combination, with a little bit of fresh baked, yeasty bread, and, to a lesser extent, some leather. The cold draw shows just a touch of resistance, and tastes of the same pungent cinnamon and raisin, as well as a surprising blast of spicy pepper. Right away, the flavor profile is surprising, combining a dusty cocoa powder, oily leather, and an interesting raisin note, the spice I expected is not really prominent at this point, and the body isn't quite as big as I figured it would be either. There also isn't any sweetness really at all. It is a very dry profile in that regard. These may well still be a touch wet, as lighting took a little more effort than cigars stored in my preferred humidor conditions take. Smoke production is awesome, putting off billowing clouds of white smoke. The flavor profile rounds out a bit after about 1/4 inch, with things getting heavier and oilier on the palate. The burn line is a little funky too, but again, these may well be a bit wet still. Additionally, by about a half inch in, the expected spiciness has arrived in spades. Not overwhelming, but leaves a pleasant heat lingering in the rear on each draw, that works wonders to balance out the other nuances present. One thing that is really impressive is how slowly the Heart of the Bull is burning. At 30 minutes, I have probably only burned 3/4 of an inch, almost an inch at most. The ash hold through the entire first third, and actually almost to the smaller secondary band before falling, which is impressive. Getting into the second third, the flavor profile has taken on a bit of bitterness as an undertone, which again points to wetness to me. Hopefully this will either go full on as a coffee flavor with some down time, or fade out. Regardless, as it stands, the flavors continue to be combination a baker's cocoa, leather, raisins, and even a dark wood, like oak, now. The burn line that was off initially has sorted itself out well, and now is perfect. great review. looks like yet another funte stick ill have to find. What a great looking stick, and a nice review as well. Imagine what these will be like in a few years. I hope to find one of these to rest for a very special occasion. Nicely done Doc. Would you say these are closer to the old forbidden or the lost city? I hear they are a bit milder than the regular Opus's. Also any chance on a hint where to pick up some of the same size you reviewed? No idea of anywhere that has any of these left, other than maybe Casa Fuente, but they were/are selling them for DOUBLE msrp. So don't bother. If anything, these actually sort of combine characteristics of all three... Opus X, Forbidden X, and Lost city. The cinnamon from the Opus, raisins from Forbidden X, and the oak from the Lost City blend. Regardless, they need some down time, to dry out. 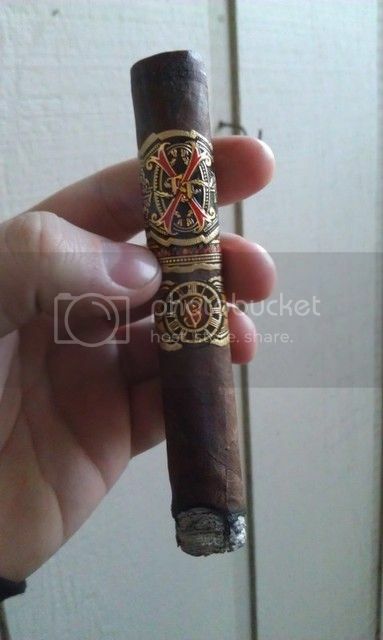 It was definitely milder than regular Opus, but the Forbidden X Toro (the "Cigar in the Bottle") is milder than regular Opus as well. Don't get me wrong, it isn't a mild cigar by any means, but it isn't nearly as in your face, big, bold, and strong as Opus this young can be. Agreed, nice review. Also, any idea what these are priced at at le Casa F? Like I said, twice MSRP, so around 30.00 for this size. Nice review. I love the cinnamon, raisin notes in these and some of the regular opus sizes. Reminds me of a cinnamon-raisin oatmeal cookie. I agree that it was milder than a regular opus but stronger than the forbidden x from 04. I imagine I should have read all of the other posts before posting.